Within the context of cartoons, the old adage that “the eyes are the window to the soul” becomes a literal truth. Murderous rage manifests through the character’s eyeballs elongating, transformed into dagger-like shapes. A shocked visage becomes amplified as the ocular orbs pop outward, stretched to inhuman lengths. And when love strikes the character, his eyes become impossibly enlarged, heart-shaped pupils at their core. These are tried-and-true concepts from nostalgic pop culture, ones that have been slowly infiltrating contemporary art through pop surrealism. Take, for example, Ron English‘s interpretation of these ideas in his Star Skull and Heart Skull works. Simultaneously a memento mori and a social commentary on celebrity, Ron English’s Star Skull puts literal “stars in our eyes”, twisting together society’s fear of mortality and undying obsession of fame that will outlive our bodies. Having debuted circa 2010 in his canvas work, like the above-pictured Supermarket Star Skull (2012), English’s ongoing exploration of this Star Skull concept would grow to include silkscreened prints in 2011. And, that same year, the artist would interpret the idea three-dimensionally, issuing the chromed starwars skull with its diamond encrusted eye sockets in an edition of 8 pieces. Then, making this commentary accessible to the greater society at large, English offered a vinyl cast edition through a Kickstarter campaign in 2014, with a variety of editions being issued beginning the following year. The artist’s similar Heart Skull concept uses heart-shaped eye sockets on the skeletal head, juxtaposing the symbolism of undying love and the ultimate representation of death. And while this design has been used by English in his two-dimensional works as well as being incorporated into a vinyl cast sculptural collaboration with Kirk Hammett of Metallica in 2016, the Heart Skull is probably best known from the various resin cast editions that have been produced by Clutter Studios since 2013. And, in fact, this rendition was the focus of the producer’s most recent gallery showcase, the I Heart Skull exhibition. 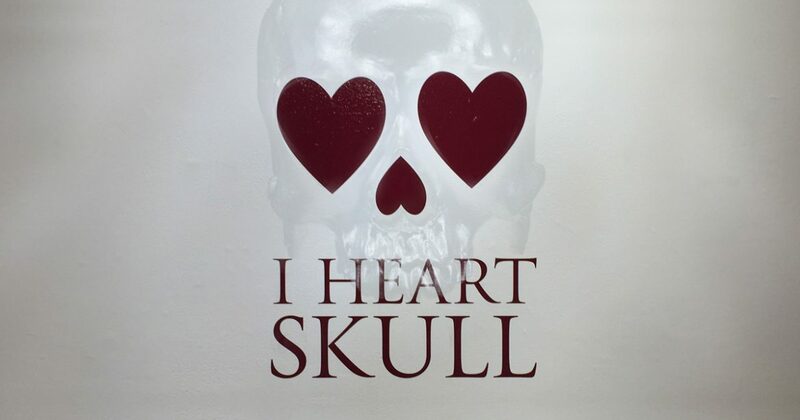 Having its opening reception on Saturday, January 13th, 2018, the Clutter Gallery‘s I Heart Skull exhibition invited a dozen artists to create uniquely handpainted renditions of English’s resin cast Heart Skull sculpture. Elegantly incorporating unmodified Heart Skull pieces into their window display, the gallery arranged seven grayish copies of the form emerging from a mossy heap. And while these illusions to the unburied dead only share their eye socket secrets with those who enter the space, their presence readies the viewer for the Heart Skull-based works inside. Dangling downward from several near-invisible strands, painter and sculptor Jim McKenzie opted to incorporate the Heart Skull into a larger, original sculpture. Titled Spider Skull, this menacing monstrocity features beautifully rendered cracks along the skull’s edgings, recessed and realistic eyes peering out from the sockets, their softness accented by the exposed tissue surrounding them. With the base form further augmented by a crown of horns atop it and a set of fang-like teeth protruding from the bottom, the faux fur covered set of six legs seems unfortunately cartoonish in contrast to the body’s lifelike depiction. Channels of orange and yellow paints create the illusion of red hot lava coursing across Kyle Kirwan‘s Caldera Heart Skull, granularly textured rock formations sculpted over the magma flow. Stylistically similar to the artist’s previous Caldera Willo (2016), Burning Bloom (2017), and Caldera Dunny (2017) creations, this piece seems perfectly suited for the concept, especially with how the teeth are incorporated into the rock-like contructions. And the depression of the eye sockets are coated strictly in the lava coloration, implying this depiction is of active eruptions that are currenly in progress. Adorned with a weathered and worn base that simulates a realistic skull depiction, artist MaloApril‘s contribution has wonderfully executed cracks along its surface as well as jewelry-like ornamentation. Accented by streaming drips of blue and purple emerging from certain points, this Heart Skull rendition has sculpted flowers blooming within its eye sockets. Creating what appears to be a stylish rendition of a calavera, the skull depictions used in the Mexican Day of the Dead celebration, even it’s title, Revive, harkens to that holiday’s theme of figuratively reviving the dead through remembrance. For those familiar with John Wayne Gacy‘s “Pogo the Clown” persona, then this piece by Grizlli Atom will immediately be recognizable as an interpretation of the serial killer’s alter ego. Decorated with painted hues that wonderfully fade into the grimey whiteness of the form, the added clown nose inset into the nasal cavity is a beautiful touch. Emanating an aura of sadness from the spherical eyeballs outward, the striped decoration on the backside of the piece hints at an American flag, the colors of which are almost exclusively the ones utilized on this Pogo piece. Coated in a glossy wash of pastel paints with a halftone effect applied over most of it, this Shiny Love Skullikins piece was executed by Jon Malmstedt under his Rampage Toys alias. Not shying away from the pock marks and blemishes on the resin cast surface, Malmstedt allows these to coexist with his form, becoming the imperfections that give added variance to his otherwise perfectly painted piece. And while easily overlooked, the black-and-white color selection for the teeth is a wise way to grant a realistic touch to this unreal coloration. Clouds of colorfulness dance across deep space, intermittently interrupted by patchs of pitch black and twinkling dots of white. Superbly rendered across the form by Mark Nagata, his Galaxy Skull creation features depictions of various planets and cosmic formations, including a total eclipse of the sun. But the front side remains more minimally adorned, the eye sockets being like two black holes, though ones that have an eerie coloration emanating from within. Employing his signature military green base coloration and weathered paint applications, artist DrilOne‘s Urban Camo Skull is adorned with splotches and markings reminiscent of his graffiti roots. Not only including his own tag, DrilOne also pays homage to street art crews from his hometown of New York City, incorporating into his decoration the acronyms for The Master Blasters (TMB), Fear The Requiem (FTR), and Robots Will Kill (RWK). Appearing like an object that had been abandoned on the streets of NYC, decayed by the elements and reinvigorated by artists, this unique work is a truly loving tribute. Curtains of greenish hues ebb and flow, quiet arcs of color subtly evolving and changing. While an appropriate description of the aurora borealis, or famed northern lights, it is also the feeling that artist Cat Atomic captures in his Atomic Borealis piece. Fused together by darkly colored stripes and dots, a light and dark green play perfectly off of one another as the metallic hue shimmers in the light. In the same manner that clinical psychologist Anne Geraghty proclaimed Death to be “the Last God”, artist Leecifer transformed his Heart Skull base into the Last God of Love & Happiness. Garnering a Seussian quality from the colorful patterns exquisitly painted on this piece’s thirteen resin cast antlers, the majority of the form is decorated with a highlighting array of purple brush strokes over its gray-white surface. And radiating from its eye sockets and nasal cavity are teases of gold, gilded illumination hinting that this piece contains divine truths. An exercise in minimal applications, Mechavirus‘ Relic piece has a sublimely tarnished surface. Coated primarily in dark brown, perfectly executed patches of wear smoothly expose light tan underpinnings with slight red accent areas. Finished with flecks of gold and silver, these specklings attract the eye but distract from the sumptuously subtle variances that lay underneath them. American Gross, the newest alias of gallery co-owner Josh Kimberg, adds his signature Penetrator aspect to the Heart Skull, a pair of spikes emerging from its eyes. Granted a gorgeous sheen from the pearlescent purple and white paints adorning it, this Love Hurts piece features a thinly dark outline surrounding the connection point of the spikes, which really draws attention to the eye sockets and their heart-shaped nature. Taking a similar tact to MaloApril’s reimaging of the Heart Skull as a Mexican calavera, this piece by Obscure uses the same overall aesthetic but with a truly differing result. Vibrant, candy colors enrich an otherwise off-white base, granting a more traditional “sugar skull” feel to the whole. Having donned a crown of sculpted roses intermixed with three miniature skull shapes, Obscure’s piece has red blooms set within the eye sockets, faint drips of crimson emerging from the cavities. As for the title of this work, it mirrors the sentiment of this entire exhibition: it’s A Dedication to the Broken Heartskulled. Having had its opening reception on Saturday, January 13th from 6-9pm, all works in this exhibition will remain on display until February 2nd, 2018 at the gallery’s physical location (163 Main Street, Beacon, NY 12508).